Moellering Library functioned as Valparaiso University’s library for over forty-five years. Dedicated in 1959 as part of VU’s centennial celebration, it was the source of much excitement. In 1969, new additions to Moellering further enhanced its capabilities in serving the students and community. It ceased operation in 2004, and the building was torn down in 2005. 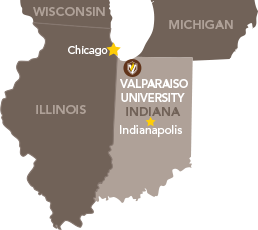 Valparaiso University has had several libraries over the course of its existence. Valparaiso University’s first library was located in the old college building. Unfortunately, the building was destroyed by a fire in 1923. After this fire, the library was then moved into East Hall. When the Lutheran University Association bought the university in 1925, the library books were transferred to Heritage Hall and the library was fully functioning by 1926. As the university grew, it became clear that Heritage Hall simply was not large enough to contain the library’s collection and to adequately serve the students. Thus, the process for the construction of a new library began in the 1950s. To read more about the VU libraries before Moellering, click here. The library that was later named Moellering was designed by Charles Edward Stade, who was also the architect of many of the buildings on East Campus. His plans became reality, due in large part to the generous donations of the Moellering family. Moellering Library was completed and dedicated in 1959. Because Moellering Library was the first time the university had a building specifically designed to house its collection of books, it was the cause of great excitement. In 1969, Moellering underwent substantial additions to further its capabilities and house its 266,000 volumes. For forty-five years, students, faculty, and the public enjoyed Moellering Library before it was replaced by the Christopher Center for Library and Information Resources in 2004. 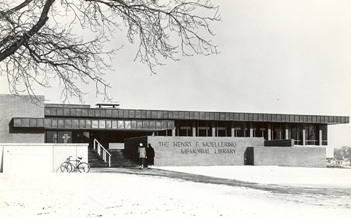 To view pictures of Moellering Library through the years, click here.